Reporter Alice Daniel, left, talks to Kearney's Themis Michailides. The California Report, a popular radio news program that is broadcast throughout the state on public radio stations, devoted five minutes this morning to a solution found at the UC Kearney Agricultural Research and Extension Centerfor a serious pistachio production problem. 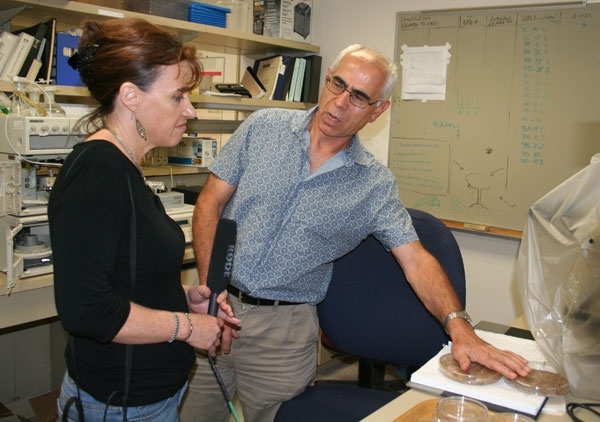 Reporter Alice Daniel interviewed Kearney-based UC Davis plant pathologist Themis Michailides, who led the team that discovered how to expose pistachio trees to spores of a beneficial fungus that displaces the fungi that produce aflatoxin. For more information on the beneficial fungus, AF-36, which was used for the first time in commercial pistachio orchards this past summer, read Pistachio farmers enlist a beneficial fungus to battle aflatoxin. Alice Daniel, a reporter for the popular statewide public radio program The California Report, visited the Kearney Agricultural Research and Extension Center today to gather information for a story on aflatoxin. Daniel interviewed Kearney-based UC Davis plant pathologist Themis Michailides, who led the team that discovered how to expose pistachio trees to spores of beneficial fungus that displace the fungi that produce aflatoxin. 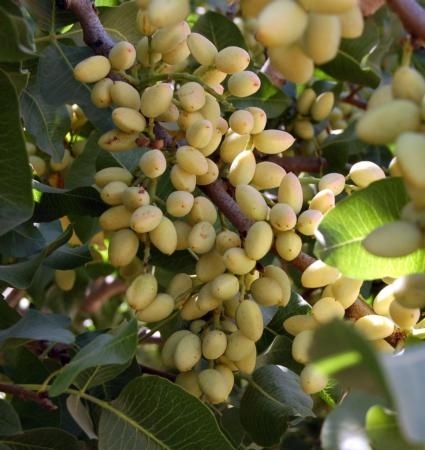 The fungus, AF-36, was used for the first time in pistachio orchards this past summer. For more on the story, read Pistachio farmers enlist a beneficial fungus to battle aflatoxin. Daniel also recently interviewed Jeff Mitchell, UC Cooperative Extension specialist in the Department of Plant Sciences at UC Davis, for a story about farmers growing interest in conservation agriculture techniques. The story aired Sept. 4 and can still be heard on The California Report website. The California Report airs locally at 6:50 a.m. and 7:50 a.m. Monday through Friday on Valley Public Radio, 89.3 FM in Fresno and is also available online.